PATEK PHILIPPE REF. 3970 EP SILVER DIAL PLATINUM BOX AND PAPERS Patek Philippe, Genève, No. 3047146, Case No. 4225228, Ref. 3970EP. Sold September 6th, 2004. 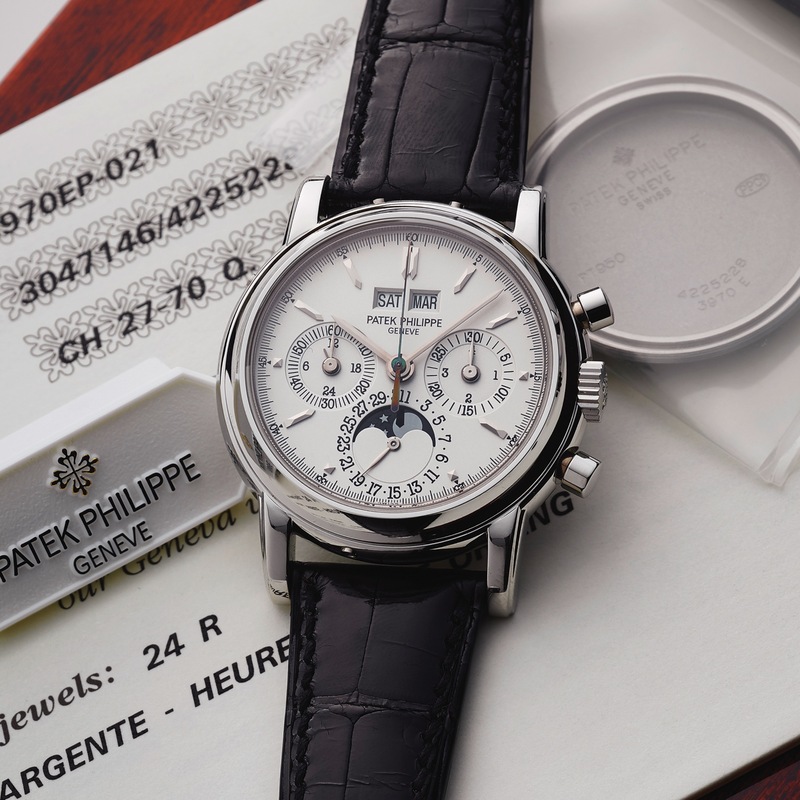 Very fine and important, water-resistant platinum wristwatch with round button chronograph, register, perpetual calendar, moon phases and a platinum Patek Philippe deployant clasp. Accompanied by the original fitted box, Certificate of Origin, setting pin, booklet, hang tag, instruction booklet and the additional solid platinum case back. Three-body, solid, polished, concave bezel, fluted lugs, transparent screw-down case back, sapphire crystals. Silver with applied baton indexes, outer 1/5th seconds track with 5-second Arabic markers, subsidiary dials for the seconds, the 30-minute register, the days of the month, the 24 hours and leap year, apertures for the days of the week, the months and moon phases. White gold baton hands. Cal. CH 27-70/155, stamped with the Seal of Geneva quality mark, rhodium-plated, fausses cotes decoration, 24 jewels, straight-line lever escapement, Gyromax balance adjusted to heat, cold, isochronism and 8 positions, shock absorber, self compensating free-sprung Breguet balance spring. C. Three-body, solid, polished, concave bezel, fluted lugs, transparent screw-down case back, sapphire crystals. D. Silver with applied baton indexes, outer 1/5th seconds track with 5-second Arabic markers, subsidiary dials for the seconds, the 30-minute register, the days of the month, the 24 hours and leap year, apertures for the days of the week, the months and moon phases. White gold baton hands. M. Cal. CH 27-70/155, stamped with the Seal of Geneva quality mark, rhodium-plated, fausses cotes decoration, 24 jewels, straight-line lever escapement, Gyromax balance adjusted to heat, cold, isochronism and 8 positions, shock absorber, self compensating free-sprung Breguet balance spring. Dial, case and movement signed. DIAM. 36 mm. THICKNESS 13 mm.